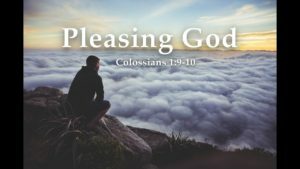 Let pleasing God be your goal. Often times we set goals for our career, our finances and material things. But we must never forget, that our ultimate goal should be pleasing God. He alone can give you the desires of your heart when your focus is on Him. Continue to praise Him, trust Him and dwell in presence. You will see that He will provide everything you need and more when you do His will. Rest in knowing that when you please God, He’ll please you. Have a wonderful Day. Take care, stay encouraged and God bless you my encouragers. Encouragers, Please check out my latest Podcast “Stop, Pause and Pray” Day 1..